Nicole Dicker 180 USD We're so proud of you Natalie! 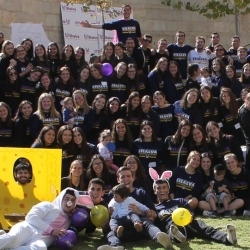 Sari Ciment 100 USD We are so proud of our daughter Rebecca for the wonderful time she spent volunteering at Shalva. Heidi Zuckerman 500 USD So proud of you Jamie! Keep on doing what you do! Randy Krevat 180 USD We are so proud of you, Julia! Marcia Forman 72 USD A wonderful cause! You go Julia! Brian Haimm 180 USD Lindsay, we are so proud of your active involvement with Shalva. Joyce Kinches 18 USD Thank you, Sammy and Shalva!